If you’re looking for the right gift for your well-traveled, savvy friend, try a Spencer’s gift card. Your recipient will be thrilled to shop from a range of international quality lifestyle products at reasonable prices. Bring the world to your loved one’s door through a Spencer’s gift card. Spencer’s is the first brand to introduce hypermarket shopping to India. It opened India’s first grocery store chain in 1920 and hasn't looked back since. Spencer’s offers a winning combination of global quality lifestyle products laid out in a fun-filled, shopping environment. Spencer’s is keen to enable a fine living to its customers at reasonable prices, thereby making fine living affordable. The staff here is knowledgeable and friendly, and the goods range from groceries, electronics, electrical goods, fashion apparel, accessories, toys and more. The brand has opened over 200 Spencer’s outlets across India. 2. Cards will be dispatched within two days of receipt of order. 3. This is not a credit card or a legal tender. 4. Bearer is the owner of the card. 5. This card holds no value until activated with a minimum load value of Rs. 500/-. 6. This card is valid for a period of 1 year from the date of activation OR until the balance in the Card reaches zero WHICHEVER IS EARLIER. 8. The return policy of Spencer’s will be applicable to items purchased using this card. In case of a replacement, goods equivalent to the value of the gift card can be purchased. Any amount above that will be required to be paid for by the customer. 9. Spencer’s is not responsible/liable for any loss to customer if the card is lost or stolen in any manner whatsoever; if it is lost or stolen it can’t be blocked. 10. This Card is only an entitlement to credit to the extent of the load value of the card at the time of the purchase. 11. The load value of this card cannot be exchanged for cash. 12. The gift card can be used for multiple redemptions against multiple bills, equivalent to the balance available in the card. 13. If purchase value exceeds the balance of the Card, the order balance must be paid with credit/debit/prepaid card or cash at the time of purchase. 16. 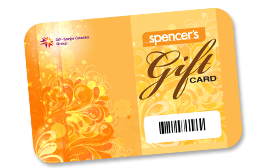 Spencer’s reserves the right to modify/amend the rules or associated benefits with this card without prior intimation. 17. This card is the property of Spencer’s Retail Ltd to whom it should be returned on request. 18. For balance enquiry & expiry, SMS SPNGC 16 digit card number to 9841646669 or call us at 1800 266 0134 (toll free operational-8.00 a.m-10 p.m all days). 19. This card is the property of Spencer’s Retail Ltd to whom it should be returned on request. 20. Spencer’s shall not be liable and responsible for any unauthorized and/or fraudulent purchase/s made using the card. The holder of this card shall be solely responsible for the safe custody of the card and the credentials mentioned on it.